action at a distance is a bewitching tangle of motors and pulleys, zigzags of rope, jangling bells, breath activators, and rough steel. 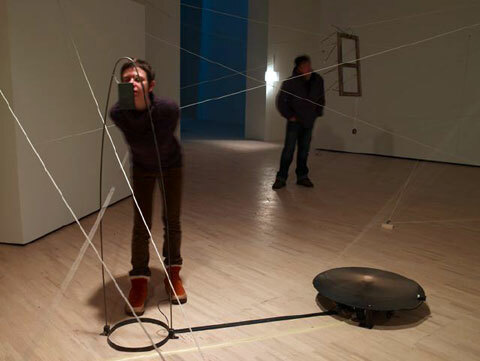 Small gestures made by visitors are amplified and transmitted via motors and twine, repurposed as the drivers of small dramas tucked into corners and nooks. Every part of the elaborate system is connected to many others. While the connections are real, physical connections, the density of the twine and awkwardness of the space make them difficult to perceive. Each of the three breath activators is connected to at least two small animal systems. They are arranged so that the person puffing on a breath activator can not easily see the result of their action. Energy from the breath activators is transmitted to the animal systems, briefly disturbing them. The animal systems are: otter theater, sand crab, birdhouse, bug box, fireflies, and diabetic cat. Despite years of practice I have gotten no better at predicting the results of my actions. I attibute this partly to the thickness of my skull, and partly to the irreducible complexity of the world. I am constantly trying to navigate the space between paralyzing analysis of every possible move and blithe disregard for the consequences of my actions. I am a terrible navigator. 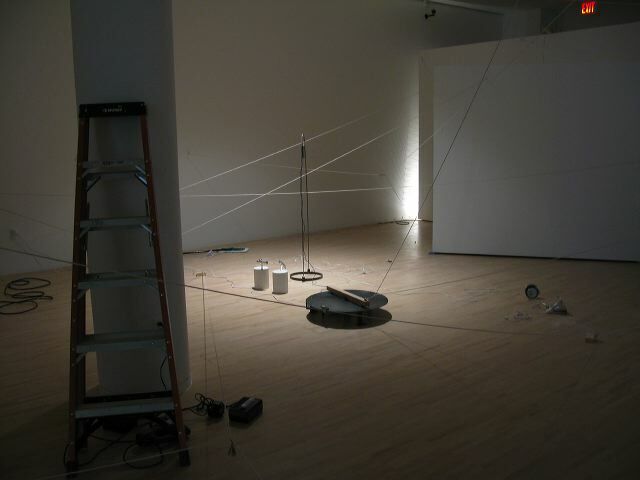 action at a distance was presented at the University at Buffalo Art Gallery in the spring of 2008 in a solo show curated by Sandra Firmin. It is a companion piece to everything, all at once.